A successful DGI portfolio can be created using very simple criteria. Just a couple of hours every quarter is all that is necessary to manage a well-designed DGI portfolio. My K.I.S.S. portfolio continues to provide acceptable (to me) dividend growth. Another good quarter for the stock market. Up over 14% over the past 3 months. And as would be expected during an up market, my dividend growth portfolio trailed the over-all return of the S&P. However, it still performed well, especially in terms of dividends produced and dividend growth. But I will go into the details of my returns and my dividends later. First, I’ll present my portfolio update and my transactions. 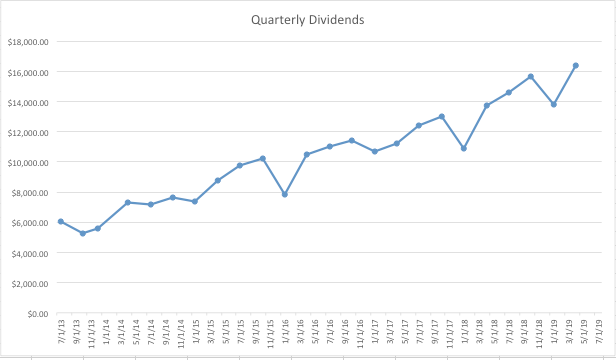 Total dividends collected in the first quarter of 2019: $16,372.15, an increase of 19.29% over the $13,742.47 I collected during the first quarter of 2018. $2,5323.87 of this was immediately reinvested through DRIP plans in my Charles Schwab accounts (See below for details). In addition to dividends $1,500 was added to my portfolio as catch-up contributions. F.A.S.T. 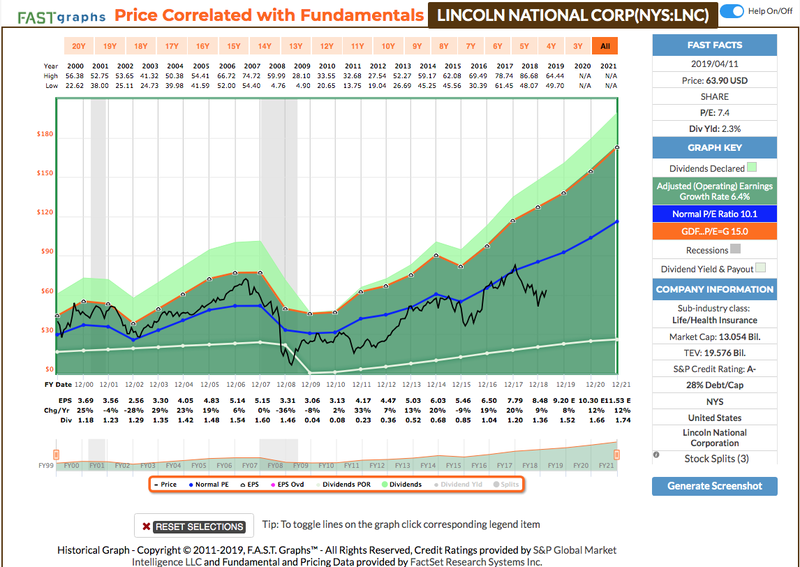 Graphs shows a 10-year uptrend in earnings, and shows that the stock is not overvalued. A dividend safety rating of 60 or more from SimplysafeDividends.com. The Chowder number is the 5 year dividend growth rate plus the present dividend yield. The use of different Chowder Number requirements is a change I made to my criteria over the past few years. I prefer to have stocks with higher yields, but if the rest of the story is compelling enough, I am willing to buy stocks with yields in the 2.0% to 3.0% range if their DGRs and Chowder Numbers are higher, as shown in my criteria above. Please see the previous article I wrote about different yields, DGRs and Chowder Numbers to read about my thinking on this topic. F.A.S.T. Graph shows that the stock is not overvalued based on its FFO. The time it takes to run this screen is only about 2-3 hours per quarter since most of the work has already been done for us by way of the CCC list, F.A.S.T. 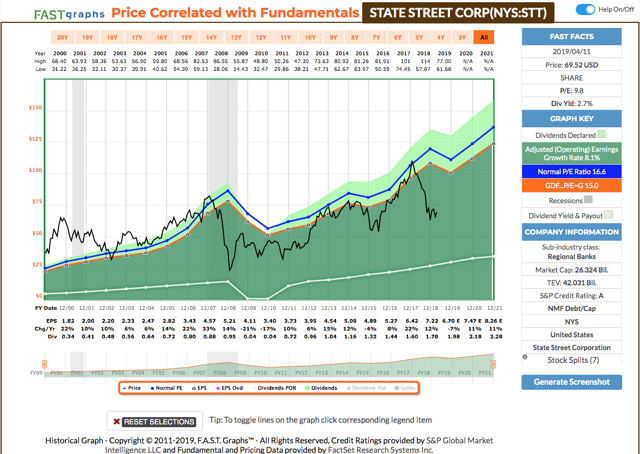 Graphs and S&P. My criteria for selling a stock are also very simple. I will only sell if the stock cuts its dividend. I do not look at anything else when deciding whether or not to sell. Therefore, the only other work that needs to be done during the quarter is to watch for the dividend announcement from each company and put in a sell order if there is a dividend cut. One caveat, as I mention below, I will sell spin-offs from my stocks if those new companies don't have dividend policies I'm comfortable or familiar with. Again, it comes down to the dividend. In early November Tupperware (TUP) cut its dividend 60% from $.68 down to $0.27. As per my rules of selling a stock if it cuts its dividend, I immediately sold it. I sold 205 shares of Tupperware (TUP) @ $28.10, commission of $6.15 for a total of $5,752.43. In addition, this quarter I once again broke my “sell only if the dividend is cut” rule. Every time I receive a dividend from a foreign owned entity I have to pay a foreign dividend tax. I HATE THIS!!!! I work hard for my dividends, and increasing my dividend income is my focus, so every time I lose some dividend to this tax it hurts me physically. Therefore, I decided to sell all my foreign stocks. I sold 225 shares of Royal Bank of Canada (RY) @ $76.86, commission of $6.75, for a total of $17,286.64. I sold 240 shares of Novartis (NVS) @ $94.83, commission of $7.20, for a total of $22,751.72. I sold 290 shares of Magna International (MGA) @ $50.63, commission of $8.70, for a total of $14,673.84. I sold 1194 shares of Invesco (IVZ) @ $19.85, commission of $35.82, for a total of $23,644.89. After selling These stocks I ran my screen and chose to buy the following 5 stocks. 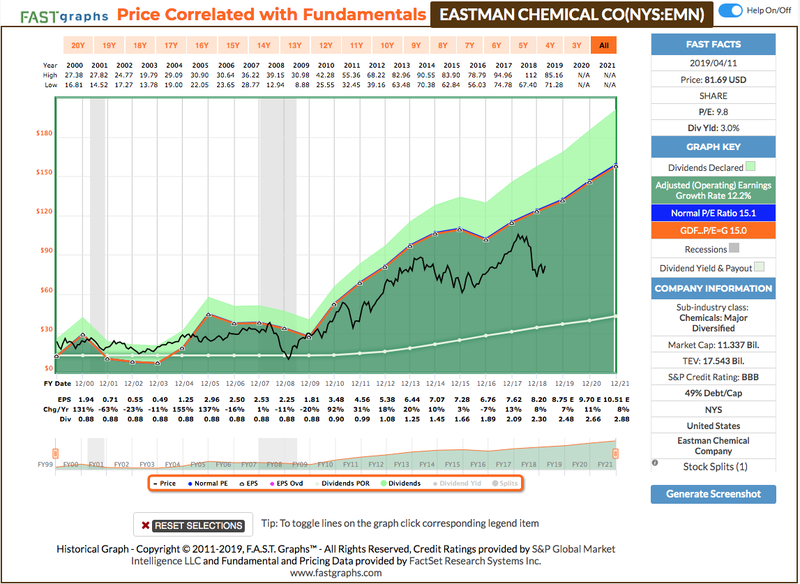 I purchased 254 shares of Eastman Chemical @ $78.80, commission of $7.62 for a total of $20,022.79. 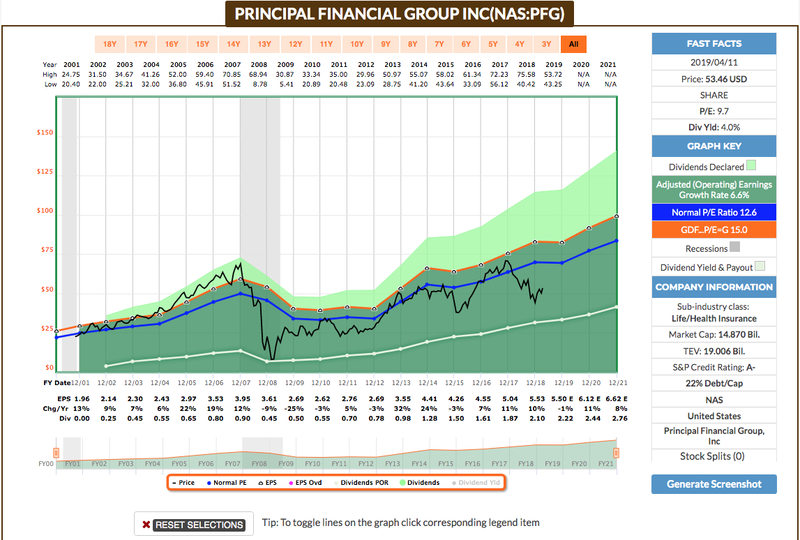 I purchased 385 shares of Principle Financial Group (PFG) @ $52.10, commission of $11.55 for a total of $20,070.01. I purchased 328 shares of Lincoln National Corp (LNC) @ $61.59, commission of $9.84 for a total of $20,211.29. I purchased 295 shares of State Street Corp (STT) @ $67.48, commission of $8.85 for a total of $19,915.45. I purchased 105 shares of Simon property Group (SPG) @ $181.71, commission of $3.15 for a total of $19,082.60. This quarter I put all of my available funds into my new positions, therefore no money was reinvested into any of my top PAAY stocks. 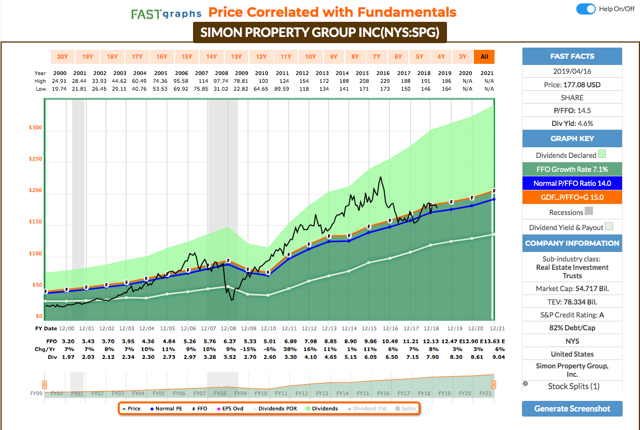 My portfolio has increased in value this quarter from $1,685,064.69 to $1,897,420.41. Not including the 401K contribution of $1,500, this is a return of 12.51%. In the same time period, the "market," as represented by SPY, was up 14.52%. I run three paper portfolios to compare to my returns, SPY, SDY and VDIGX. For each of these portfolios whenever I have cash contributions put into my real-life account I also put the same amount into the paper portfolios and "buy" more shares of the individual indices. And when SPY, SDY or VDIGX pays a dividend, it gets reinvested into more paper shares, just like I reinvest my real-life dividends in my portfolio. As far as I can tell, this is the most accurate way I have to compare their performances. So this month I have matched SDY, but trailed SPY and VDIGX. During the first quarter of 2019, I collected $16,372.15 in dividends. This is an increase of 19.29% over the $13,742.47 I collected in the first quarter of 2018. With the dividends that have already been declared for each of my companies, the amount of dividends I expect to collect in the next 12 months (ED12) is $61,33128. This is still below the $61,743.43 that I reported for my ED12 in my third quarter of 2018. This is due to the sale of BPL last year and the sale of IVZ and the other stocks this quarter, and the replacement of these stocks with other stocks with a slightly lower yield. However, I’m sure that difference will be made up with my usual dividend growth over the next year, as well as more dividends created by the purchase of stocks with my upcoming pension contributions. It is important to note that the growth in my ED12 is due both to the dividends expected from new contributions, as well as the actual organic dividend growth of the stocks in my portfolio. The present yield of my portfolio is 3.23%. This is a fairly large decrease in my yield over the past 3 months. This decrease is mainly due to the over 12% rise in the portfolio value. As the stock prices have gone up their yields have gone down. As shown in the following graph, my dividend income continues to grow year by year. A good comeback after a weak fourth quarter, both in total return and dividend growth. My portfolio continues to meet both my needs (for my eventual retirement) and my desires for market matching returns. I am a part-time investor. I do it as a hobby, and because I trust myself to look after my interests more than I trust anybody else to do so. I am not a professional and have no formal training in finance, economics or investing. Most of what I know I have learned here on Seeking Alpha. If I can produce dividend income and total returns that match, or even beat the market, then anybody can. All you have to do is take the time to read about DGI from some of the best contributors here on SA (DVK, Chowder, Mike Nadel, Bob Wells, etc. ), set up a system that you are comfortable with and stick to that system. And try to keep it as simple as possible. The more complicated it is, the harder it is to follow, and in my opinion, the worse your results will be in the end. As I've already said, but must reiterate, my mindset is to grow the dividend income produced by my portfolio, and not necessarily to focus on growing the size of my portfolio. In the long run, by maintaining my discipline and carrying out my K.I.S.S. criteria, I believe in the end I will beat the market. DGI has taught me to have a long-term focus, and for that focus to be on the dividends, and not so much on price movement. The prices of some of my stocks may fall from time to time, but as long as the dividends continue to rise, I know the stock prices will eventually recover. More importantly, while waiting for that to happen, I will continue to collect dividends from those stocks. And as the dividends increase, if the prices stay low, it will just give me even more opportunities to buy more shares of undervalued stocks. I'm already enjoying some of the benefits of my patience, as I was able to buy more stocks at depressed prices, which means I will collect even more dividends in the coming years. So my plan going forward is to continue to focus on the dividends and to follow my simple K.I.S.S. rules. They have been working very well so far. I believe my results continue to support my hypothesis: that by using simple, straightforward, easy-to-understand criteria for buying and selling, and by using the hard work of other people (thank you David Fish, Chuck Carnevale, S&P and all the wonderful SA contributors I have learned from! ), someone can achieve excellent investment results without having to put an inordinate amount of time into the process. Thank you for reading my article. I welcome your comments and criticisms. Disclosure: I am/we are long PFG, STT, LNC, EMN, SPG. I wrote this article myself, and it expresses my own opinions. I am not receiving compensation for it (other than from Seeking Alpha). I have no business relationship with any company whose stock is mentioned in this article.